Robert Kemm was a British painter who lived in London from 1837 until 1895. He was considered a Romantic painter of Genre scenes, especially Andalusia landscapes and figures. This artwork called "Admiring the Painting" was painted in oil and is a highly staged piece of work. The room setting could easily be the artists studio, with the easel, palette and assortment of props. 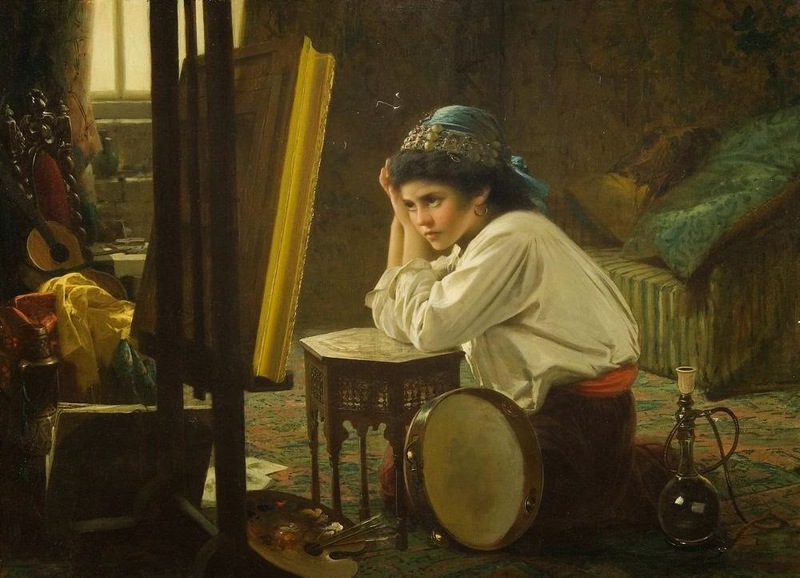 In the 19th century Orientalist themes were very popular and Robert Klemm might have used a local model and dressed her up in garments from the Orient. Artists would often bring home souvenirs from their travels to use later as props in paintings and to add visual interest to the setting.